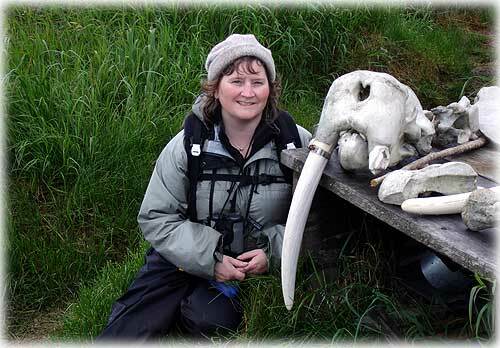 Pictured: Karen Brand, a Staff Officer with the US Forest Service, Ketchikan-Misty Fjords Ranger District, at the Walrus Island State Game Sanctuary. Ketchikan: Round Island: A Wilderness Adventure By MARIE L. MONYAK - Is the plural of walrus, walrii? What do walrus use their tusks for? How fast can a walrus swim? What state can lay claim to the largest state park in the nation? Karen Brand, a Staff Officer with the US Forest Service, Ketchikan-Misty Fjords Ranger District answered those questions and more, at the Southeast Alaska Discovery Center this past Friday evening. Meyers Chuck - Meyers Chuck Residents and Others Challenge Emerald Bay Timber Sale Again - Residents of Meyers Chuck, users of the Cleveland Peninsula, and regional and national conservation groups filed an appeal against what they say is a money-losing timber sale that would damage stunning Emerald Bay on the western shore of the Cleveland Peninsula. Tongass National Forest Supervisor Forrest Cole recently signed the Emerald Bay Record of Decision in November, approving the harvest of approximately 16 million board feet of timber from 600 acres on the Cleveland Peninsula. According to the Forest Service, the proposed project which is located approximately 40 air miles north of Ketchikan within the Ketchikan-Misty Fiords Ranger District would provide nearly 90 jobs in Southeast Alaska. Alaska: Alaskans Mourned In Aftermath of Helicopter Crash ; Four Alaska National Guard members among 12 killed in Iraq Incident - The U.S. Department of Defense has announced today that all 12 people aboard an Alaska Army National Guard UH-60L Blackhawk helicopter were killed when it went down near the Iraqi town of Tal Afar. The fallen aircraft was part of a two-helicopter flight moving between bases in northern Iraq when communications were lost shortly before midnight on January 07, according to Multinational Force Iraq sources. The crashed helicopter was located around noon on Jan. 8. Flight records indicated that eight passengers and four crewmembers were aboard. Alaska: Alaskans warned of Scam Medicare Prescription Drug Coverage sales - Alaska Division of Insurance Director Linda Hall today issued a warning to consumers to beware of scam artists selling Medicare prescription drug plans (PDPs). "While there are many legitimate companies marketing this important insurance product, there are a few unscrupulous people marketing scam products," said Hall. "Alaskans purchasing these plans should check with the Division of Insurance to make sure they are dealing with a licensed agent." Examples of unscrupulous practices include using high-pressure tactics to persuade consumers to purchase a plan they do not need or cannot afford and mixing products other than Medicare prescription drug plans in the insurance package. There are also criminals who sell "plans" that do not exist, taking consumers money and leaving them uninsured or under insured with plans that do not meet federal and state requirements. Under the federal government's new Medicare Prescription Drug coverage benefit for Medicare beneficiaries, private insurance companies are selling these new Medicare PDPs. Medicare must approve the plans before they can be marketed legally. Ketchikan: Forest Service Announces Recreation Facility Plan; Public meeting planned for Ketchikan - For many people, cherished memories are the most important things the Tongass National Forest produces and recreation sites, such as Forest Service cabins, help create those memories. That's why the Forest Service is crafting a "Recreation Site - Facility Master Plan" for the nation's largest national forest. The new plan will reduce backlogged maintenance items by 25 percent over the next five years and will result in improved recreation sites. "In the long run, this will enhance recreational experiences for forest users because facilities, such as cabins, will be better maintained," said Tongass National Forest Recreation, Lands and Minerals Staff Officer Scott Fitzwilliams. "In order to accomplish that goal, we need to develop more efficient ways to manage the sites, look at alternative funding, and close a few sites that get very little or no use." Monday, January 09, 2006, 5:50 pm - The Ketchikan Borough Assembly will hold a special meeting in the City Council Chambers. Fish Factor: Major Fisheries Changes Can Affect Whole Communities By LAINE WELCH - The Bering Sea crab fishery, now newly operating under a quota share plan, has been in place for just a few months, starting in August with golden king crab along the Aleutian chain, followed in mid- October by the red king crab fishery at Bristol Bay. As intended, the "rationalization" program (referred to as crab ratz) has ended the race for fish. At the same time, it has changed the traditional pace, pricing and patterns of the crab fisheries, and drastically reduced the number of players. Kodiak, King Cove and Sand Point have partnered to provide an early glimpse at how crab ratz is trickling down into their towns. They've hired a fisheries economist to track three key things: how many people are working in the crab fisheries, how the compensation of crews and skippers has changed under the new system, and how spending by the fishing fleet may have changed. "It takes decades to really understand the effects of a major fisheries change, but it does have a profound effect on just about everyone involved or associated with that fishery. It affects whole communities," said Gunnar Knapp, an economist at the University of Alaska/Anchorage Institute of Social and Economic Research, who will lead the study. Sitka: Four Wilderness Medicine Classes To Be Offered - The SouthEast Alaska Regional Health Consortium's Emergency Medical Services department will be offering four wilderness medicine classes in Sitka over the next few months. The SEARHC EMS classes offer a national certification through Wilderness Medical Associates (WMA) that is good for three years. 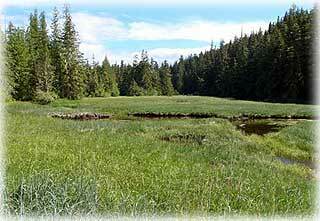 The courses are useful for anybody who spends a great deal of time in the Alaska outdoors. Some emergency medical services units, guide services and search and rescue squads require these courses, and a few groups will pick up all or part of the tuition for their students. Southeast Alaska: Forest Service Proposes Minor Amendment to 2005 Planning Rule - The USDA Forest Service is seeking public comment on a proposal to allow the Tongass National Forest to use either the 1982 planning rule or the 2005 planning rule for adjustments to its Forest Plan that are required by a recent ruling in the Ninth Circuit Court of Appeals. On August 5, 2005, the Ninth Circuit Court of Appeals issued a decision in Natural Resources Defense Council v. U.S. Forest Service, 421 F.3d 797, that requires changes and adjustments in the 1997 Final EIS and Record of Decision for the Tongass Land Management Plan. Southeast Alaska: Senator Stedman Hires 2006 Session Staff - Senator Bert Stedman (R-Sitka) announced today his staff for the 2006 legislative session. On January 5th, new hires Kim Carnot and Jane Kasberg joined existing Stedman aide Miles Baker in Juneau. Alaska: ESA Foundation offers scholarships to Alaska residents - The ESA Foundation, a non-profit tax exempt, philanthropic and educational organization has scholarships available for the 2006-2007 school year. Any Alaska resident attending any college, university or vocational school can apply.